I am always happy to discuss ideas - without any obligation on a client’s part. If you would like to commission a sculpture, for your garden for example, I will visit you, take photographs and come back to you with ideas. 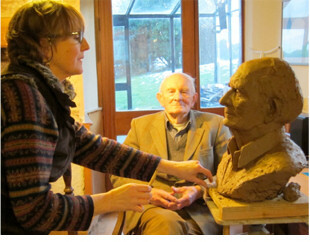 To have a portrait in terracotta (fired clay) costs in the region of £1,000. The cost of mounting, usually wood or stone, is extra. If I travel to the sitter's house, which I am happy to do, travel costs are added. Approximately six sittings of 2-3 hours are needed. Tea/coffee breaks are obligatory! Portraits can also be cast in bronze. The end result is permanent and can look very fine. This would be an additional cost of approximately £1,250 to £2,000 depending on the size of the piece and how much neck or shoulder is included. I make three visits to the foundry during the casting process. The total cost of a portrait in bronze, mounted on stone, would be approximately £3,000.